Snoring is an inconvenience, both for yourself and every other member of your household. If, like me, you’re tired of waking up to the accusatory stares of your loved ones, you’ve probably been through your fair share of anti-snoring remedies. I’ve tried nasal strips, and many of them reduce snoring. Anti snoring devices work for me but take several days to adjust to. So, when a friend told me about the Sharper Image Pillow, I was eager to give it a shot. If a pillow can be an aid for snoring, I’m all for it. 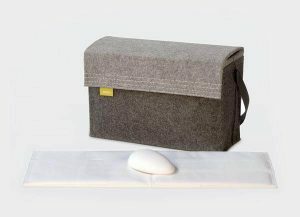 The anti snore pillow is shaped in a way that positions the sleeper on their side, with the head tilted slightly back. In theory, this aligns the jaw and opens up the airways, increasing the airflow and making it easier to breathe. This should reduce the vibrations in the mouth and throat that cause snoring, and result in a quiet, and more restful night’s sleep. It sounded promising, so I put in my order online and gave it a try! First, the ordering process. This was very simple to navigate on the company’s website, and I was given a 15% coupon the first time I visited the site. The pillow arrived quickly and the shipping was free. This is a medium sized pillow, of medium thickness, and made of memory foam. I was keen to take it to a test run, so I popped on the pillow protector that came included with my purchase and tried it out that very night. I was apprehensive about the pillow at first, but I needn’t have worried. The way the contours of the pillow cradle your head make sleeping on your side comfy, and while it does tilt your head back, it does so at a gentle angle that isn’t particularly noticeable. Comfortable: I got a good night’s sleep using this pillow, and was comfortable. The contours of the pillow cradle your head in a way that feels natural, just like a regular pillow – I didn’t notice the tilt at all. Restful Sleep: I had quality of sleep with this pillow. Easy breathing makes for better rest, and I wake up feeling more alert and refreshed after a night on the Sharper Image Pillow. Good value for money: The Sharper Image Pillow will set you back around $70, which is fairly standard for a premium pillow. It has a two-year warranty. Possible to adjust sleeping position: Although the pillow is designed for side sleeping, it is possible to adjust your position if you like. If you want to sleep on your stomach, you can turn the pillow sideways and rest your head in the crevice. For back sleepers, this pillow is suitable for those with a mild to moderate snoring problem. May not be effective for very heavy snorers: My snoring problem is best described as moderate, so this pillow had no problem in helping with snoring reduction. However, for those among you with sleep apnoea or other conditions that cause heavy snoring, this may not be an effective solution. 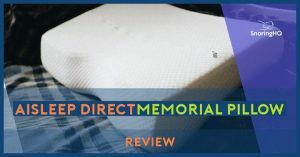 Not quite as comfy as the leading brand: Although this is indeed a memory foam pillow, it doesn’t quite hold up when compared to the market leaders. Custom fit pillow protector: This creases easily, and was wrinkled after just one night of use. I tried to purchase a second one, but they aren’t sold separately, and the standard sized pillow cases I have at home don’t fit properly. It’s not a deal breaker. Not for fidgety sleepers: If you’re the type to toss and turn a lot as you sleep, the shape of this pillow won’t suit you at all as it doesn’t allow for a lot of free movement. 30 days to resolve snoring – huh? This is the claim of Sharper Image, and doesn’t make a great deal of sense for a product that works this way. Never mind, though – this pillow sorted out my snoring from the very first night of use, so no complaints here! If you’re a mild to moderate snorer, the Sharper Image Pillow could be the perfect solution for you. It’s a simple solution to combat relaxed airways, and delivers results without any need for invasive devices. Purchase the Sharper Image Anti Snore Pillow from the official website. This pillow could improve your quality of sleep. It’s comfortable to sleep on and allows you to get a restful night’s sleep that will leave you feeling alert upon waking. Another pillow that is worth trying is the new Casper Pillow.